I love wine. I didn't develop a taste for it until I worked at what was called the Terrace Bay Inn in my hometown as a college student. We had nightly wine specials so naturally the owners wanted us to know what the wines we were selling tasted like. After that, there was no turning back. Now this. Winc. Ahhh, Winc! Where have you been all these years! This is a really fun and exciting way to try new wines. It is extremely easy and convenient, and getting wine delivered to my house is just fabulous. Here is how it works: You go to https://www.winc.com/usfamilyguide (using this will get you $22 off your first month!!) Click Get Started and it will ask a series of simple questions about your palate. How do you like your coffee, how do you feel about salt, do you like citrus flavors, what's your take on earthy flavors, do you like berries, are you an adventurous eater - easy right? Then you get to build your box. You can choose 2 white 2 red, 1 red 3 white, 3 red 1 white, all white, all red. I chose 2 of each because I honestly like almost any wine - leaning more towards dry reds, but I do love a sweet wine once in awhile. You click See Your Wines and then it has you create an account, which you can link Facebook or Google with, or if you prefer, you can just use your email. Browsing the wines was the most fun. They do offer some suggestions for you, or you can scroll through and choose your own. The descriptions for the wines I ended up getting were spot on, so I am happy to say that I can trust what they are telling me. Obviously, some palettes differ, but it worked fabulous for me! 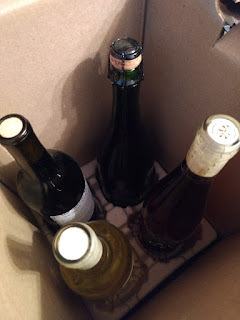 After filling your box with 4 wines, it ships after the order is placed. My order was placed on May 30th and I received it on June 5th. It came via FedEx Home Delivery and someone 21+ has to sign for it, naturally. I got text alerts from Wincthemselves once it shipped but was notified through FedEx about the remainder of my delivery. So the text alerts were lacking in my opinion. Once delivered you get to open that personalized, beautiful box of yours and enjoy right away, or store for special occasions. The other plus? They have a wonderful recipe section on the website! 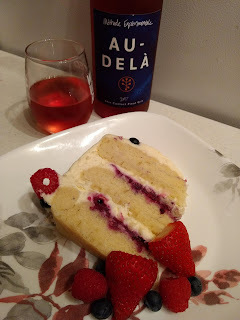 You have to at least take a look here https://www.winc.com/recipes. Who doesn't love food and wine!? One of the coolest wines in my box was Au-Dela Pinot Gris . It is one of there featured orange wines and was so tasty. It is half fermented with the skins on and half fermented in the barrel, with a slightly bitter undertone from the orange peel, yet not overwhelmingly so. There is a touch of honey and I found it light bodied. It is also vegan and made with organic grapes! How awesome is that! 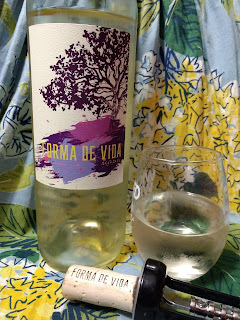 Another delicious one in my box was Forma de Vida. It was crisp, slightly dry, with a hint of pear. This would go wonderfully with an arugula salad. In your account, they also have a section called My Wines that you can click and they give you tasting notes and recipe pairings. Perfect for planning a special dinner or brunch. What's awesome? I have two bottles left. I've always wanted to stock up, so to speak. It's always nice to have a bottle to bring to a dinner with friends, or pull out when you have an impromptu guest. 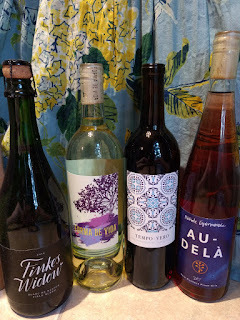 I am in love with Winc, and I really think that any wine lover would be. Don't miss out on the fantastic deal I am offering to all my readers! Get $22 off your first month when you go to https://www.winc.com/usfamilyguide. Share with your friends! Thanks Winc, for this fantastic wine club. You. Are. Fabulous. Cheers. *Worth noting - The top picture is actually a small book that has a A-Z of wines. Read it. You won't be disappointed. 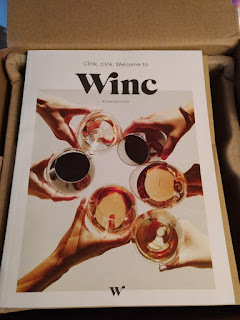 **I received a complimentary month of Winc to test and review there product and service. All opinions are 100% my own.